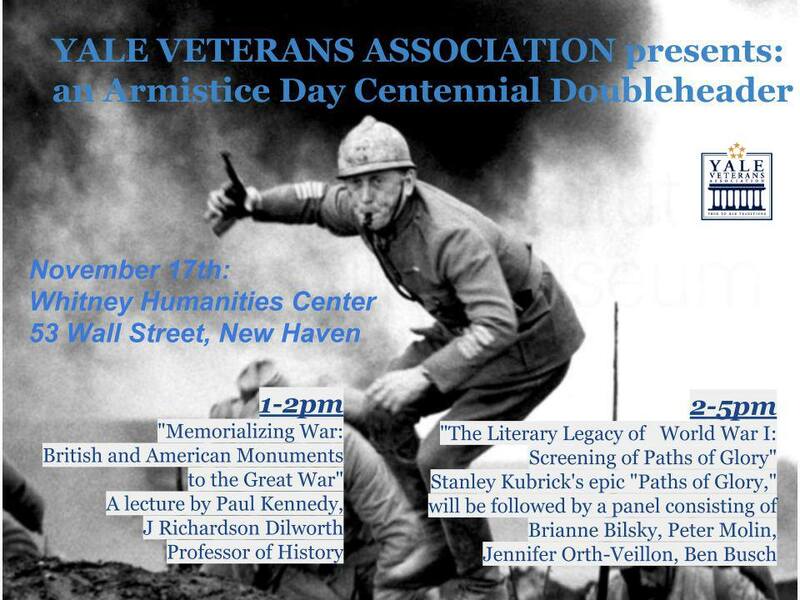 Many thanks to the Yale University Veterans Association for the invitation to moderate a World War I Armistice Day Commemoration panel on WWI literature and film. 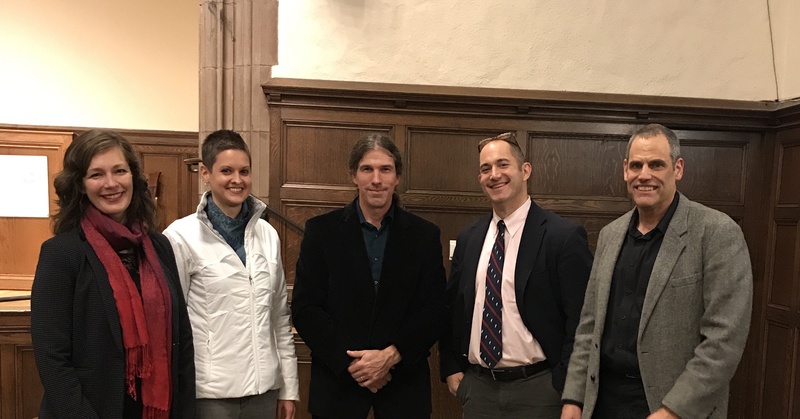 The event was coordinated and hosted by Adrian Bonenberger, a Yale graduate, 173rd Airborne paratrooper, author of the memoir Afghan Post, co-editor (with Brian Castner) of the collection of contemporary war short-fiction The Road Ahead, and currently an editor of a Yale medical-science journal. Bonenberger invited an eclectic group of war artists and scholars to participate in a very cool endeavor: linking contemporary war-writing to precedents established by veterans and talented artists during and after “The Great War.” Joining me on the panel, which served as the capstone for a week of commemorative events, were Benjamin Busch, Jennifer Orth-Veillon, and Brianne Bilsky. Busch, well-known to readers of Time Now, is a film-maker, poet, photographer, actor, and memoirist of very high order. Orth-Veillon is the editor of the fantastic WWriteBlog, where she has published reflections on World War I by many modern war-writers. Bilsky, now a dean of one of Yale’s residential colleges, is a former colleague on the faculty of the Department of English and Philosophy at West Point, where we frequently taught World War I writing to cadets. The set-up for the occasion was intriguing, as it demonstrated the appetite of the Yale community for honoring veterans and for thinking about war-related issues in serious, complex ways. After an informative and enjoyable lecture by Yale historian Paul Kennedy on World War I memorials, we, along with our audience, watched Stanley Kubrick’s 1957 movie Paths of Glory, about French soldiers court-martialed for cowardice in World War I, and then discussed it in relation to the post-World War I artistic tradition. Next, we segued into discussion of World War I writing to which we felt personally connected. Finally, we tried to suggest the wider impact of World War I writing on contemporary veteran-authors and culture-wide thinking about war. What can be said about World War I writing that hasn’t been said before? To some extent, perhaps not much, because that’s some very well-trod critical ground. The better question is what rings particularly true today? Below are some of my thoughts on the matter, inspired by our panel. One is the general truth that World War I veteran-writers and contemporary war-writers are both well-read participants in the literary traditions they hope to join. Each cohort has gone to war and then written about it with a swirl of precursor works in mind, the Western tradition of classics for World War I writers and the 20th-century body of war writing-and-film for modern veteran authors. Another link is a characteristic subject: the disillusionment of the individual soldier, caused not just by the slaughter and stupidity he (or she) witnesses, but in the collapse of the dream of heroism, inflected with huge amounts of survivor guilt. This morphing of heroic possibility into lacerating self-reproach is related to the way that soldiers were randomly and unglamorously killed in the two wars: by gas, artillery barrage, and mowed down by machine-gun in World War I, and blasted instantly off the face-of-the-earth by IED explosions in Iraq or Afghanistan. A third is a similarity in tone, different from the hard-boiled feel of the great World War II novels and the moral outrage of Vietnam War fiction—a tone more elegiac or hesitant or softer or somehow regretful. While World War II and Vietnam writing often seems testosterone-soaked, few World War I or Iraq/Afghanistan authors come off as tough guys, and most give the impression that he or she would view extreme masculine competitive aggressiveness as a pathetic pose in the face of circumstance. Connected to this last notion is a shared sense of futility about the respective war efforts, and a distancing from responsibility or even care for strategic goals and national aspirations, which are typically categorized as vain, foolish, or irrelevant to the individual soldier experience. These are just some ideas, surely there are others. Not every aspect of contemporary war-writing need have an antecedent in World War I, and the World War I canon is not beyond criticism—in fact, the canon cries out for “problematizing,” to use academic-speak, on several grounds. Still, it would be a foolish contemporary war-writer who set pen to paper without first reading the works authored by World War I combatants and interested non-combatants touched by the war, and it would be a very good one who surpasses or transforms the marks they established. The event had a special family significance for me: My grandmother’s brother left Yale during World War I to fight in France, where he suffered wounds in a gas attack from which he never fully recovered. Jennifer Orth-Vellion, Brianne Bilsky, Benjamin Busch, Adrian Bonenberger, me. This entry was posted on December 26, 2018 at 12:01 am and is filed under Art and War. You can subscribe via RSS 2.0 feed to this post's comments. Your observation about the different, “hesitant, elegaic” or almost “softer” tenor of WWI writing is a really insightful one, and perhaps crystallized for me (in a way I hadn’t thought of before) why the writing by those veterans has always been uniquely appealing. The Yellow Birds set the tone from the jump. A counter-formation might be the sniper-and-SEAL-superhero genre epitomized by American Sniper. But what Chuck Klosterman said of celebrity-blogger Perez Hilton—“You can find a lot of people who like him, but it’s hard to find an intelligent person who does”—would seem to apply to such works. The question might be whether the thoughtful-and-sensitive warrior-protagonist might be generally realistic depiction or an atypical literary affectation, hoped-for ideal, or marketing ploy. Or something else. Nico Walker’s Cherry speaks to his question, and I’ll be writing about it soon. I got the sense,perhaps incorrectly, that this was your introduction to Kubrick’s “Paths of Glory”. It became an affectionate ribbing of me in my SF career, my tendency to show that movie (video back in the days, then DVD) yearly as my contribution of NCO-DP (officers included, as this is SF we’re talking about). Another b&w movie I kept on-hand for NCO-DP is the French classic, “Battle of Algiers”. In fact, that one was a part of the curriculum of the SFQC back in the late 70’s, showed in class to those of us seeking the green beret back then in all its actual film-thru-projector nature. (No, video then.) The lessons of “Algiers” for those of us soon to be warfaring in the guerrilla and counter-guerrilla mode are obvious. If you’re unfamiliar with it, it’s well worth a viewing. It’s up there on my Top Five B&W war movies, along with Kubrick’s “Paths of Glory” and his (of course!) “Dr. Strangelove”. One last little note about “Paths”. It was my inspiration (as a film) for the screenplay “Tattoo Zoo”, which I wrote in 2009, long before I even imagined it would be my novel opus magnum. In a sly hat-tip to the film, I even named the main character LTC Douglas (after Kirk Douglas), who became LTC Dove for a variety of artistic reasons in the novel. I was a screenwriter then, having spent twenty-some years in the biz (as they say in Hollywood), with good luck and bad; never even thinking of writing novels in those days, and loving the concise, haiku-like script form. “Paths” was the inspiration, because the real-life inspiration (the need I had to tell the story, even as allegory) was actual corruption of command I witnessed in combat, frying a handful of enlisted and officers for political correctness (a sharp turn from WWI’s killing them as example).